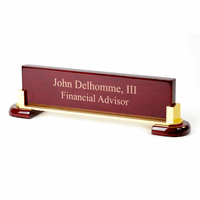 FEATURES/SPECS Perfectly suited for any decor, this solid glass desktop name plate will let anyone and everyone that sits down at your desk know just who they're dealing with! Its made of polished, crystal clear glass edged and detailed to perfection. 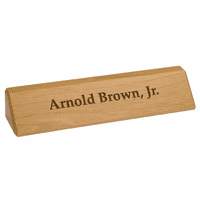 The name plate can be laser engraved with up to two lines of personalization, perfect for adding a name and job title or a name and company. The plates is held in place by two polished silver columns mounted on a solid glass base. 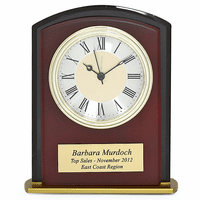 This personalized glass name plate is ideal as a business gift for a VIP or as an employee recognition award for a valued worker. 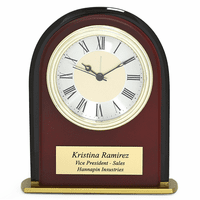 Dimensions: 10" x 2 1/2" x 2"
Can a company logo be engraved on the nameplate? Yes, but there is a five piece minimum order. If you are ordering five ore more, you would just place your order but under engraving put ***LOGO***. Then reply to your order confirmation email with your logo. We'd put together a proof for your approval or editing within 2 business days. I need only a 2 " H by 10 " by 1/2" width-HOLDER ONLY to slide my already have name plate into. I'm sorry, we don't have anything like that. Good Morning. I was wondering if you offered any discounts if I were going to order 9 of these glass desktop name plates. Thank you. Yes, use the coupon code egscoupon100 to receive 10% off your order, along with free engraving and free shipping. Thank you! Great gift to celebrate a promotion! The nameplate was shipped quickly and exceeded expectations...very solid, beautiful glass and metal that can fit a tradional or contemporary desk. So pleased! Very classy and stylish, exactly what we wanted! It's going to make a wonderful gift for a dear friend!!! ProsPerfect size, pretty lettering and very professional looking. This is an elegant, beautiful and classy nameplate. It was made in a day and exactly as ordered. I could not be happier with this purchase. Absolutely beautiful.I have been looking a long time for a different kind of name plate.These are are perfect and my staff was equally excited to have such a beautiful name plate.Thank you so much they are perfect. This is a nice looking item, and it seems to be very well made. 1st class in workmanship ! Super fast shipping ! Well packaged ! Wonderful and quick service! Excellent product! Extremely satisfied! I bought this high-quality name plate for a friend who just got a new desk. It was a perfect gift for her. The materials are substantial and well-built. It's a perfect size. It's beautiful, but doesn't overwhelm a desktop, even a smaller desk. It actually appears much more expensive than the $49.00. I was happy with this purchase and will be back for another gift. I was very pleased with the way the nameplate turned out. It was exactly as it was shown. I gave it as a gift to a co-worker and she was very pleased with it. Received it in a very quick timeframe. Let me start by saying thank you so much for sending me my item as requested. The item was perfectly wrap and made to perfection. I love it and I will be ordering from you guys more often. I am extremely satified with your service and yes the product is top quality. Thank you. ProsI love it and the product is worth ordering. ConsI don't really have any complaints about this product. I am very happy with the product. Thank you. a gift. The who received gift loved it. Thanks!!! I love my glass desktop plate!!! I was a bit nervous about ordering online, but this website has definitely erased my worries!! Perfection at its finest! 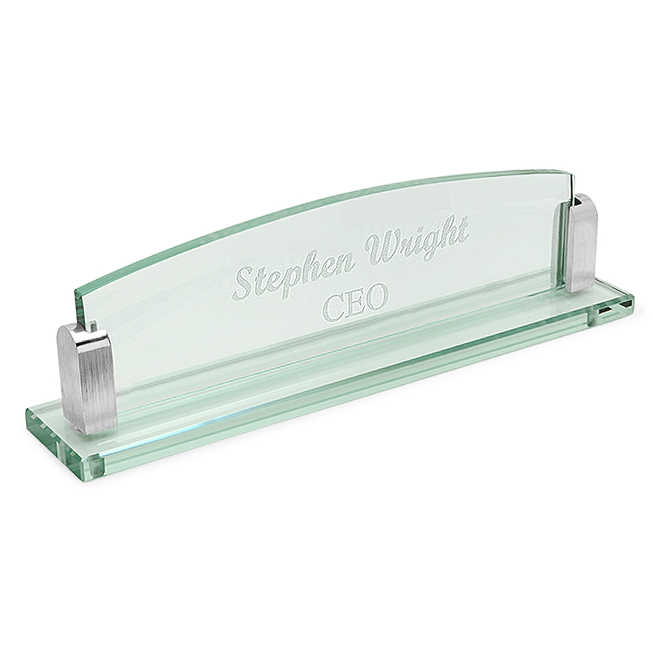 The Glass Desktop Name Plate is a great gift for anyone. The Glass Desktop Name Plate is a well made quality product that would be a welcome addition to anyone's desk. ProsWell made and the Text is beautifully done. I purchased this as a gift and had it shipped directly to the recipient. I was concerned because I wouldn't have the opportunity to see the finished product until after it was received. The recipient was ecstatic! The quality was superb and I am very pleased with this product. The glass desktop name plate was a gift for my husband who just started his own company. It was just the right gift for his new office. It was professionally done as well as the more expensive companies have done them, but much more affordable. ProsLooks great and very professional. ConsNone. Great work on the product. I love the way the name plate looks. Very classy. I would change the way the name plate sits inside the base. I don't like that the name plate sits inside the brackets loosely. Should be more secure the brackets so if you picked it up to move on a desk it doesn't just come out of the base. And with being glass if your not careful moving it it could break if not careful. Add stronger brackets with some type of cushion to not break the name plate. And put some type of rubber corner pegs on the bottom of base. It will look great on a desk just don't move it. I was nervous when I did not receive an email confirmation, so I called. The rep was very courteous and reassuring. The nameplate was delivered promptly, and the end result was beautiful! The nameplate came out really nice but it could have easy been broken the way it was packaged.